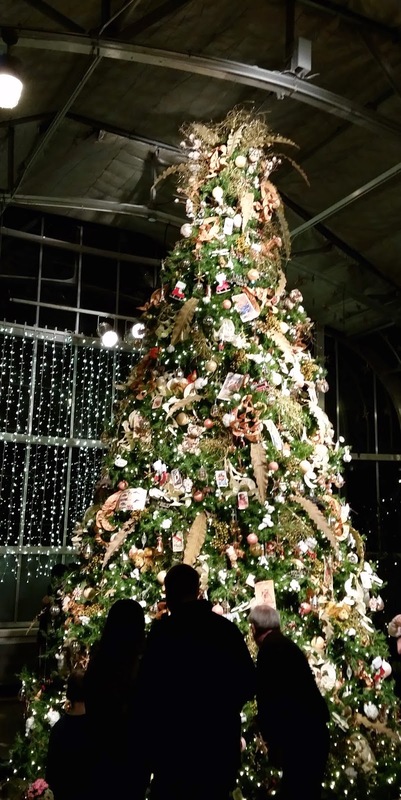 This weekend we continued our Christmas cheer with a trip to the Dominion GardenFest of Lights at the Lewis Ginter Botanical Gardens in Richmond, Virginia. Families and couples alike come from all over to walk through this garden light festival each year. 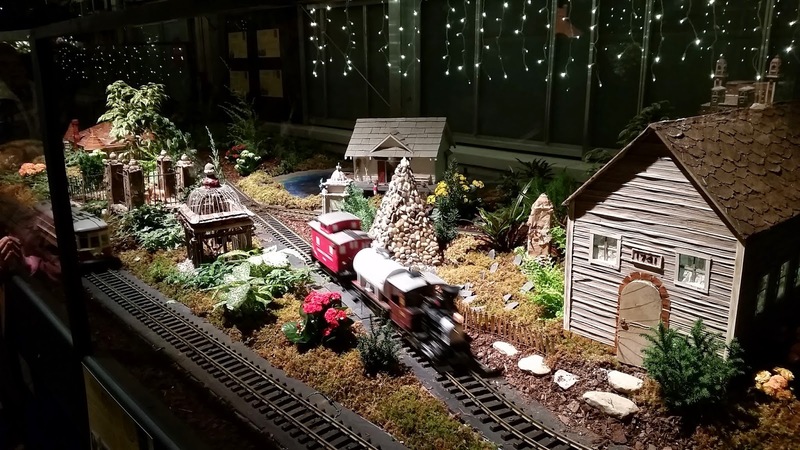 With more than half-a-million lights to walk through, a tiny fairy garden, two small model trains and a fire-pit to roast s'mores and drink hot chocolate, it would have been hard not to have a great time. Arrive early--around 4:30pm to 5:00pm is the perfect time to score great parking and enjoy fairly open walkways. Purchase your tickets ahead of time. A service charge does apply, but it's worth it if you have little ones. Dress for the weather. As the sun goes down, there's a noticeable temperature drop. Consider bringing a stroller. While the gardens aren't overly-large, paths can become crowded. It also makes for a great place for kids to rest while they enjoy their s'mores and hot chocolate, as seating is limited outside. 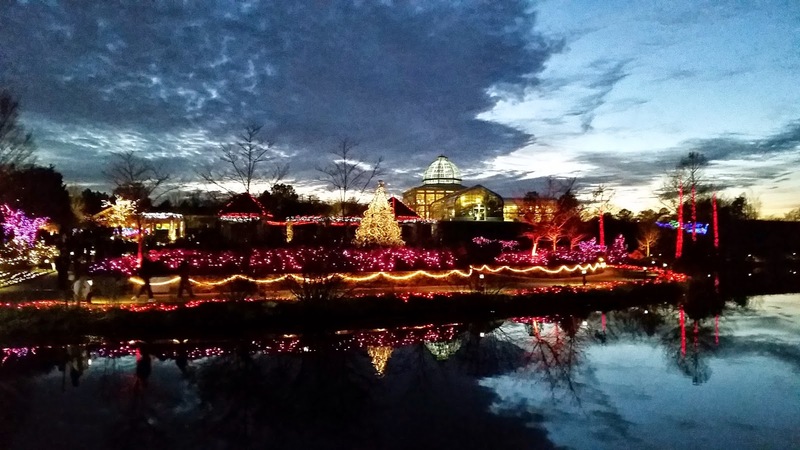 The Gardens are open from 5:00 pm to 10:00 pm and kids under 3 years old are free. 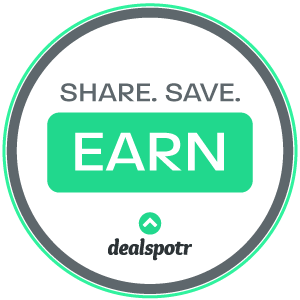 Adult tickets for non-members are $12 and children 4 and up are $8. While this is a beautiful little place for a date night, it's really perfect for families with small children. The looks on their faces as they stare at all of the lights are priceless and as if making s'mores isn't enough, there's an awesome wooden play area for them, too. As the night got a little chillier, we reached the indoor exhibit. A tiny room to the left led us down a path of friendly fairies and trolls. The next room housed a giant Christmas tree decorated with more toys than you could count and stuffed animals poked out at every angle. 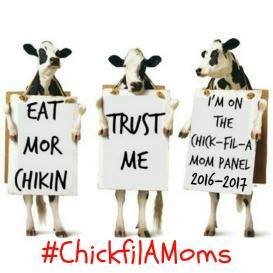 I was amazed that we didn't see any kids make a grab for any. It was a great low-key activity that took us about an hour to walk through and I imagine most every child that left that night passed out on the way home, if not before leaving the parking lot. If you haven't made it yet, there's still time! 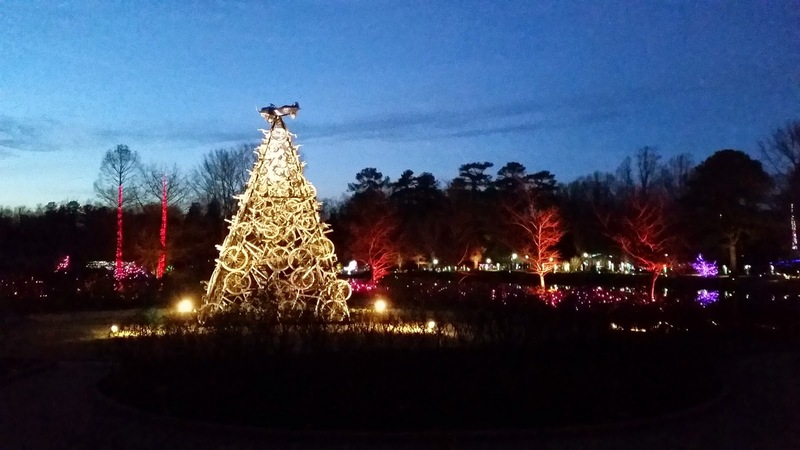 The GardenFest of Lights goes on until January 12, 2015.